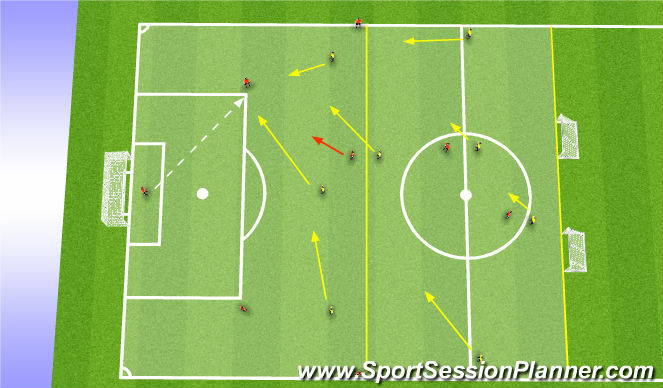 Football Problem | poor pressing of opposition centre-backs in possession allows them too much time & space to make penetrative runs or passes forward into central areas. Key Principle | deny opposition time and space to build up. What? | opposition centre backs are allowed too much time & space to dribble / pass forward to central players in midfield. When? | when opposition #3 or #4 have possession. Why? | our front three aren&apos;t pressing collectively and it&apos;s far too easy for opposition to play through them to central areas. 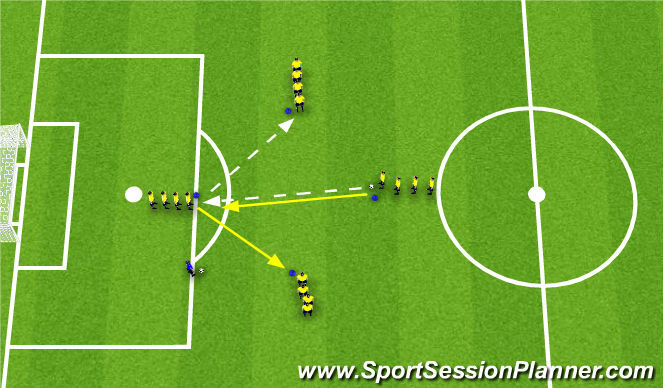 Session Objective | my aim is to improve my team&apos;s ability win the ball back in the front-third by pressing collectively, restricting central passing lines and by forcing play backwards or sideways and stopping the switch. 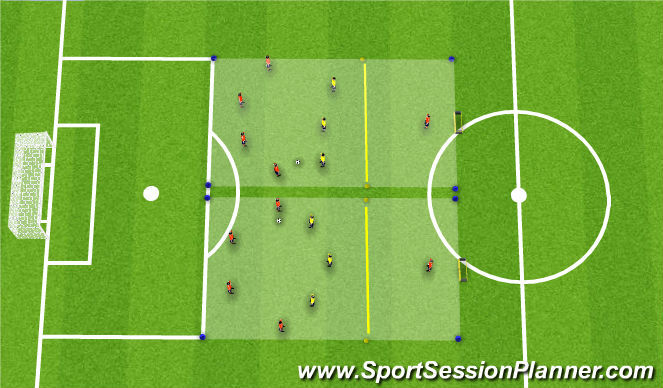 Player in possession pass to the man opposite and immediately presses to deny space | receiver invites pressure before playing left & moving right. If the player opposite is receiving, you must immediately press to deny space. [Play left / move right / immediately press opposite receiver]. 1. Play right / move left / immediately press opposite receiver. 2. Freedom to choose direction | only caveat being that you must move the opposite direction to which you play. 3. Defender to influence direction of pass by arcing the press [make play predictable]. Back four playing out to 1 target man vs. #7/11/9 in 2 grids – 16 players in total. Can 4 Blues play through to target man in end zone for a point [target man must turn & finish in goal]. Can Red win the ball & dribble over area boundary (left / right / in front). BP 4 defenders start with ball from edge box, playing out vs. opposition #7/11/9. To start 4 defenders must shift the ball left-right in an attempt to find a chance to play through | must play in front of opposition BPO attackers (no runs to receive behind). Stop opposition playing through to target player. 1. Second phase - if BP play through, they must move to combine with target in end zone before scoring in mini-goal / BPO attackers can now recover, balance and press to prevent this. To begin, BP#1,3,4,2,5,6 and BPO#9,7,11,10 are limited to the final third. BP#8/10 and BPO#6/8 are limited to middle third. Restrictions are OFF, once BP play into middle third successfully. 30 seconds to score - if ball goes back into final third with opposition in possession, restriction are back ON. Play continues. BP - score in large goal / scoring from a transition = 2 goals. Stop the opposition playing from back third to middle third successfully. 16 players total | BP#1,3,4,2,5,6,8,10 vs BPO#9/7/11/10/6/8/2/5 set up as shown above. A supply of footballs is placed in one large goal so that play may be restarted quickly from GK. Play throw-ins from sideline & goal-kicks from large goal only.